I’m not sure that I can truly claim an obstructed view this week, other than the fact that I may be blinded to reality by being obsessed with a series of referee decisions, or actually non-decisions. Viewed from the privacy of my own sofa, as usual I bow to anyone with a different view from the stands at the Etihad, although they may themselves have fossilised by having to endure the lack of atmosphere in one of the soulless grounds I’ve ever been to. I watched a City game there once with a mate who had a season ticket, and it was a good game, made dull by a lack of any discernible crowd noise, and even watching U2 in concert there was an excruciating experience – no decent acoustics at all. New ground for us, yes, but be careful what sort we wish for. Anyway, back to the game. In truth, we lost to a better team, and sometimes you have to hold your hands up and admit it. It could have been different – if we’d managed to hold on to a lead for longer than 90 seconds, if we’d been given as stonewall a penalty on Lukaku as they were awarded on Zaballeta, if we’d concentrated instead of being distracted by a Coleman vs Negredo stand-off, and of course if Naismith could find a better touch. But I don’t agree with some tweets I read that our defence was awful, even if we have ended up conceding three goals. City play a brand of football that we aspire to, and frankly they have better players to do it overall, assuming they actually want to play, which they did today. We are still a work in progress, and to have more than held our own in the first half shows that we will succeed, and all we need to do is to be patient, get our best players back, get everyone properly fit, and maintain the intensity over 90 minutes and not just 45. Our defence stood up well, bits to learn, but very few teams will unpick us the way City did – maybe Arsenal, but can’t think of any others. As we lost, I’m going to start with the negatives this week. Sorry, it may be unpopular to say it, but Barkley was poor today. He seemed a little star struck if I’m honest, and you know, this boy is 19, and days like today are the days when he’ll learn more than he will when he waltzes through the opposition. 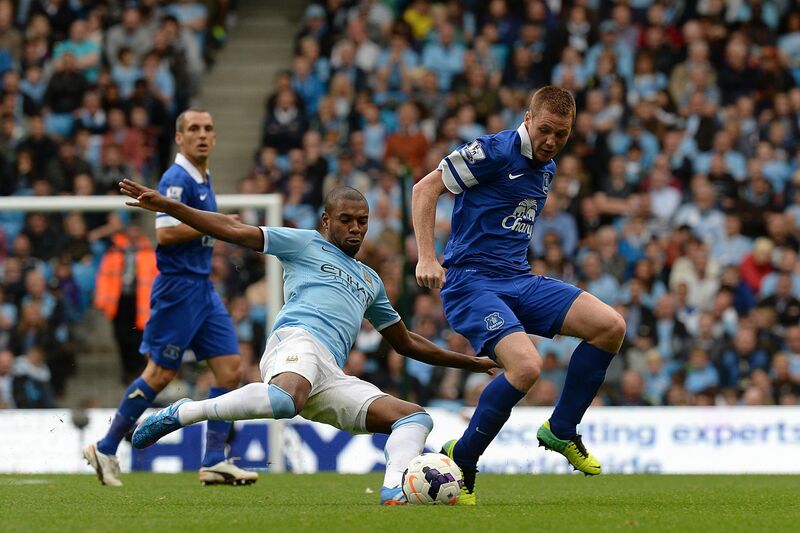 Martinez will sit down with him and work it out – he needed to play the ball quicker and more directly. Not one of his best, and the break will do him good. Can’t see him starting for England after Roy watched that performance. I’m pretty confident Mirallas wasn’t fit. When he was released early on down the left he tried to pass, when last season he’d have used his pace to accelerate in to the area. On reflection, maybe a whole 90 mins for Deulofeu would have been wiser, although that might have needed a more traditional 4 4 2 to compensate for Gerard’s lack of tackling capability. Osman – oh dear. Asked to play a different role today is not great for someone low on confidence and form anyway, but I thought he was anonymous today. He has been a fantastic servant for the club but his days are numbered. As are those of Naismith, who once again showed the deftness of touch of an elephant. I’m sorry, but balls don’t stick to his feet, and his work rate just isn’t enough to compensate for me. He needs to go in January I’m afraid, and I for one have been keen to give him a chance, and he’s had a run at it now, and shown he can’t hack it at this level. Maybe he’d be better as a striker, but he’s not going to get that chance here ahead of Lukaku, Jelavic and Kone. The rest was much of a muchness, with one notable exception. McCarthy was immense today, ran his little freckled legs off, a constant ball fetcher and carrier, and took on most of Osman’s workload as well. A fine performance from a player growing in to a top-notch Prem player at a top-notch Prem club. I’ll let others bemoan our misfortune with the decisions of a mystifying Mr Moss. Sorry, when I say ‘mystifying’ I mean useless. Making mistakes is something we all do, but one hopes that if we get a decision wrong, we at least make sure we are consistent. In the cold light of day, it was a penalty, but so was Lukaku’s. Silva was lucky to stay on the pitch, and I’m not sure Milner was even going to get booked until the 4th official had a word in his ear. But what might have turned the tide didn’t happen, we got what we got, didn’t get what we should have got, and in the end we lost and probably deservedly so, painful as it is to say it. But I’m heartened by another showing over 45 minutes of the quality we have in the side able to play a brand of football that will get me standing on my feet, that will bring us goals, and will bring us a fantastic season of growth and development. Where we will end up is too early to say, let’s have a look in December, and worry about Hull next – a physically strong and actually quite skillful side, a side unlikely to be weakened by many if any of its players playing internationals. I’ll be back in the Upper Gwladys on 19th October, ready for the next step on our journey to a new and better place. One step back today, but let’s hope for two forward against Hull. who wants to play at the Etihad, when you can fulfil your dreams in the hovel that is goodison park. That sounds a little bitter. You shouldn’t need to worry about others if everything at City is so perfect! @StDomingos1878 very accurate. Glad you highlighted McCarthy. Yep better side. Hope we learn from it.